Five professional highlights from the past year - Michelle Rogers, Inc. The past year was filled with behind-the-scenes hard work, expanding on my current knowledge and building my online brand. Here are a few highlights from 2014. 1. Attending two blogging conferences. In October, I was invited to Fitness Magazine’s Blogger Meet and Tweet in New York City, and in May I went to Fitbloggin ’14 in Savannah. Both of these events offered excellent opportunities to learn at breakout sessions, to network with bloggers from around the country, and to connect with brands in person. 2. Explosive social media growth. I worked every day to grow my presence on social media, and was especially active on Twitter, Facebook and Instagram. As a result, my followers on Twitter nearly tripled this year, Facebook doubled and Instagram quadrupled. 3. Developing a media kit and working with brands. The growth of my healthy living blog now attracts brands interested in partnering with me on promotions such as reviews, giveaways and advertising. This year I really delved into that aspect of professional blogging, and have enjoyed the experience. I also created a media kit with information about me and the website, such as how much traffic the site receives and the services I offer. I send this to brands who request information, and to those I’m pitching. Please contact me if you’d like to receive it, and I’ll send you one with my latest stats. 4. Welcoming new clients. I had the pleasure of working with Dr. Jennifer Swanberg of the University of Maryland, and created an outstanding website promoting her research. She was so pleased with my work that she referred me to a colleague at the University of Kentucky, and I’m currently working on a new site for their research project. 5. Presenting. I was asked twice this year to be a guest lecturer in classes at UNC, one of them an undergraduate public relations class and the other a master’s level class. I spoke on using social media and blogs strategically to promote your organization. 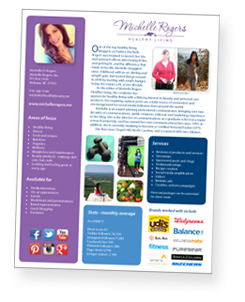 I was also thrilled and honored to be asked to present at the upcoming Charlotte Fitness and Health Expo in January. I’ll be speaking on, “Five Simple Secrets for Starting–and Sticking to–a Workout Program,” a very timely topic for those whose New Year’s resolution is to lose weight and get in shape. I’m busy working on that presentation now, and am so excited about this opportunity! 2015 will no doubt be another busy year, and I’m excited about the new adventures to come.